This article is about Edo. For more information, see Tokyo (disambiguation). Edo (江戸) is the former name of the Japanese capital Tokyo, and was the seat of power for the Tokugawa shogunate which ruled Japan from 1603 to 1868. During this period it grew to become one of the largest cities in the world. The site of the city, on what is now known as Tokyo Bay, had been settled for several centuries, but first became historically significant with the building of Edo Castle in 1457 by order of Ōta Dōkan. Kyoto was the site of the Japanese emperor's residence and the capital of Japan for many centuries, until the Tokugawa shogunate was established in 1603 and Edo became its seat of government. From that point Kyoto remained merely the formal capital of the country, while the de facto capital was now Edo, the center of real political power. Edo consequently rapidly grew from what had been a small, virtually unknown fishing village in 1457 to a big city of 1,000,000 residents by 1721, the largest city in the world at the time. 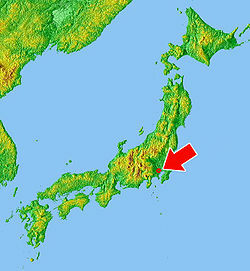 In 1868, when the shogunate came to an end, the city was renamed Tokyo, meaning "eastern capital", and the emperor moved his residence to Tokyo, making the city the formal capital of Japan. Wikimedia Commons has media related to Edo. ↑ Gordon, Andrew. (2003). A Modern History of Japan from Tokugawa Times to the Present, p. 23. This page was last changed on 27 November 2018, at 03:02.